Located in Northwestern Fluvanna County, this public lake was developed with support from the Fluvanna Ruritan Club, which secured the location and land for the lake. County residents fondly refer to this lake as Ruritan Lake. Constructed in 1956, this 50-acre lake lies in the gently rolling Piedmont of Virginia. Remnants of an old mill now lie submerged under ten feet of water in the center of the lake. Each spring, visitors to the lake are greeted by a burst of color from the numerous Mountain Laurel and dogwood trees along the shoreline. Fall brings an explosion of rainbow colors as the trees herald the approaching winter. The heavily wooded shoreline interrupted by only a few homes nestled along the northern portion of this rural lake guarantees a quiet and restful visit. Located within a pleasant half-hour drive from Charlottesville, this lake is off Rt. 619 just west of Cunningham (Rt. 53). Look for Public Fishing Lake signs on Rt. 53 in Cunningham and follow to the lake. A nice population of largemouth bass, bluegill, crappie, and redear sunfish inhabit the lake. Although the lake is not noted for trophy bass, the lake is lightly fished which can provide anglers with ample opportunities to see a lot of action with little distraction from other boaters or anglers. The bluegill population is improving after several years of downturn and should provide anglers with many hours of enjoyment. The lake is one of the few Department owned lakes that is consistently fertilized to improve the quality of fishing. Fertilizing has doubled the poundage of fish that would normally be in the lake, adding to the angling opportunities at the lake. To enhance fishing, a number of exotic fish species have been stocked in the lake over the last 20 years, including walleye, tiger musky, and northern pike. Of the three species, only the walleye were stocked for more than 5 consecutive years and the last stocking of walleye occurred in 1997. The occasional walleye may still be hooked but the population should be declining rapidly. Today, only catfish are being stocked annually to help diversify the fishery. The lake has an average depth of three feet and shallow flats with numerous stumps can be fished at the upper end of the lake, providing excellent crappie fishing in the spring. Two fish attractors (marked by floats) are provided by the Department as a fishing aid and provide hot fishing spots for crappie in the warmer months. The 12-inch minimum size limit has been removed. Currently, there is no size limit on this species. There is a daily creel limit of 5 bass per day. NOTE: Swimming, sailing, wading, and trotlines are prohibited. Fishing involving prizes is also prohibited. Trapping by permit only. Nets, seines, and gasoline motors are prohibited except for official Department duties. A parking lot is provided for all visitors and a concrete boat ramp, although long and steep, provides access for small boats and canoes. Anglers can fish the shoreline near the ramp and along the dam that is adjacent to the parking area. This 50-acre lake, owned and managed by the Department of Game & Inland fisheries, has provided an excellent fishery since it was constructed in 1955. 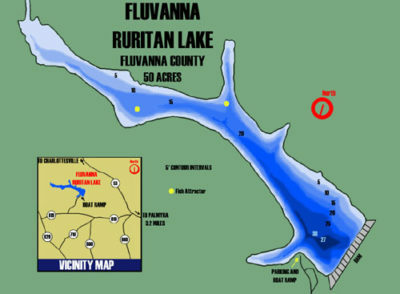 In the early 1950’s, the local Ruritan club expressed an interest in developing a lake in Fluvanna County and they acquired the land that later became Fluvanna Ruritan Lake, named in honor of the club for it’s efforts to bring a recreational lake to the county. Fisheries management by the Department has historically consisted of numerous techniques, including stocking, lake fertilization, and creel regulations, to improve and sustain an excellent warm water fishery for anglers. Fish populations are checked on a regular basis every three years by the Department to determine if problems exist and if changes in regulations are required. This area of Fluvanna County does not have naturally fertile soils and this is reflected in the low fertility of the lake water. To compensate for this natural deficiency in nutrients, the Department has annually added liquid fertilizer (10-34-0) to the lake. The resulting higher fertility creates a bloom on the lake in the summer and the water looks like pea soup. The bloom increases food production for the fish ultimately resulting in several hundred pounds of fish per acre at Fluvanna Ruritan, double the poundage of fish it would have naturally. Channel catfish are being stocked every other year to maintain a good, harvestable population for anglers. Walleye were stocked for many years to diversify the fishery and provide another large game fish. Walleye are maintained in most Virginia lakes by annual stocking, a costly process, and few walleye are ever caught or harvested in small lakes with low populations of walleye. Future stocking of walleye has been suspended indefinitely while the Department decides how best to manage for this fish in lakes of this size. Future plans for the lake remain much as they have for the past 50 years. This rural lake continues to provide an excellent resource for anglers and other outdoor enthusiasts. Add to the recreational benefits the esthetic qualities of a mostly forested shoreline, no gasoline motors, and only the occasional additional angler competing for space, and it is a perfect spot to fish. Take Route 53 west of Palmyra and turn west on Route 619 at Cunningham and follow the directional signs to the lake. The lake is open 24 hours a day, year round.